Remaining comfortable at sea is mostly about keeping dry as moisture of any form cools the skin, be it a dump of the proverbial briny down your neck or your own body perspiration after a frenetic grinding session on the winch; the result is the same. Arguably, the really clever stuff happened in the late ’80s and 1990s when the first breathable fabric, Gore-Tex, arrived on the scene to transform our oilies into sportswear. More recently the biggest strides forward have come in design and feature-rich clothing says Martin Burke, CEO of Australian marine clothing manufacture Burke Marine. "This includes ergonomic athletic-fitting design, better waterproofing features such as sealed zips and hoods with side windows that allow unrestricted vision," Burke told Trade-a-Boat. Boat shows, like the upcoming Sydney show, are great opportunities to feel, try on and compare brands. Among the large manufacturers Trade-a-Boat talked to for this editorial both Musto and SLAM will be demonstrating new ranges at Sydney along with Gill as well. 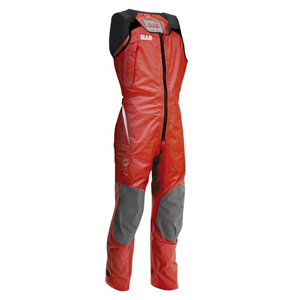 Musto’s HPX Pro Series is a professional race-developed range. Cultivated from the Volvo Camper campaign it is a stiffer, tougher, stripped-out suit, designed to endure the punishing use of professional sailors in hostile Southern Ocean conditions. Also at Sydney is the new range of SLAM Force gear, available in four levels, with the top Force 4 arriving this summer after its development on the leading Volvo Groupama round-the-world yacht. Joining them will be Gill’s new range of women’s OS1 offshore gear so there’s plenty to check out. Top photo: Volvo 70 Camper is a tough test of the latest Musto HPX Pro Series wet-weather gear. British-based Gill manufactures clothing for a wide range of boating, covering everything from dinghy, powerboats to full offshore. Gill’s patented material is 5 Dot, a waterproof and breathable three-layer fabric used in its high-end OS1 Offshore range of jackets and OC1 Smocks. The OS2 range is also offshore-ready but of a lighter weight. Good features include double flaps on the jacket zip, Solas approved reflector strips and an internal chest pocket protected by a water resistant zipper. The OS1 Trouser. Hot features: internal fly eliminates need to undo braces, pockets for radio and multi-tool, plus adjustable ankle flaps. The OS1 Woman’s trouser has a female-specific drop seat, knee and seat abrasion protection, and fleece-lined handwarmer pockets. 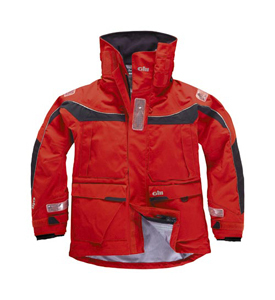 Gill OS1 Offshore man’s jacket. Hot features: ocean-height collar with wraparound face guard and fold-down face flap, lined with a gridded thermal fleece around the neck and face for comfort. The hood is rollaway and can be adjusted, while there is a fleece lining along the forehead. The OS1 Woman’s jacket is of similar construction to the man’s, but available in a variety of bust, waist and hip sizes. British Musto is one of the oldest brands on the market, established in 1965 by British Olympic sailing medallist Sir Keith Musto. 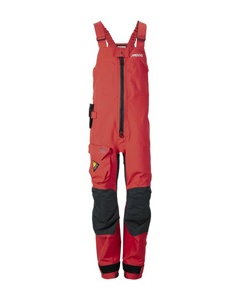 This specialist company offers several ranges of offshore clothing — HPX, MPX, MPX Race and the just released HPX Pro Series. The brand is strongly favoured by blue-water sailors and is currently used by several of the Volvo round-the-world yachts including Team Camper. The feedback from this severe testing, which of course includes the Southern Ocean, is invaluable to the development of its technical HPX gear. 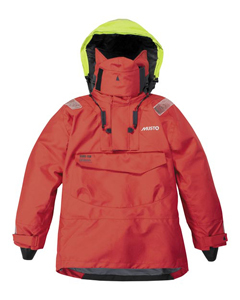 Musto’s range topping HPX clothing uses a three-layer technology with Gore-Tex the core, plus Ocean Technology and Gore Micro Grid Backer. For comfort, stretch Gore-Tex panels are also used to allow freedom of movement. Due for release at the Sydney boat show, the HPX Pro Series is a result of Volvo collaboration. 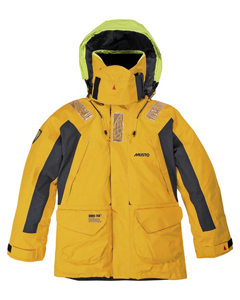 Unique to Musto, it is a stiffer and tougher stripped-out suit, designed to endure the punishing use of professional sailors in hostile Southern Ocean conditions. HPX Pro Series Smock. Hot features: constructed with stretch material throughout, latex neck seal, spume visor with rigid hood, and high protective collar. The Pro Series also has lifejacket attachment points, fleece-lined collar, Cordura on wear points and adjustable cuffs. 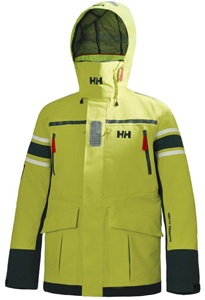 HPX Ocean Jacket. Hot features: Three-layer Gore-Tex, stretch material (polyamide, Lycra), two-way YKK zip, spume visor with rigid hood, and high protective collar. The HPX also has lifejacket attachment points, fleece-lined collar, Cordura on wear points and adjustable cuffs. HPX Pro Series Trousers. Hot features: Two-way Riri zip with gusset, dual waist adjustment, Cordura seat and knee reinforcement, articulated knees with removable protective panels, and cargo pocket. Henri Lloyd has been manufacturing top-level ocean clothing since 1963, when it began production in Manchester, England. 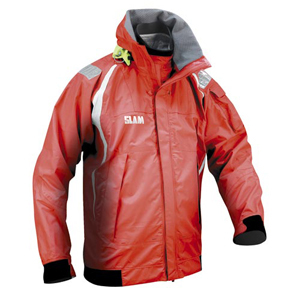 The company offers one of the widest range of foul-weather gear on the market, with several levels of offshore and inshore clothing. 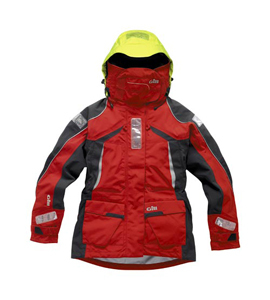 Material used is primarily Gore-Tex for its high-end Ocean Explorer range and a mix of TP fabrics throughout the coastal and inshore clothing. Reflecting the high speeds super maxis reach, Henri Lloyd’s Shockwave range of smocks and salopettes includes body armour. The Ocean Explorer collection is constructed in three layers, with Gore-Tex core-bonded to a tough outer material and an inner lining. As one of the major brands, its gear is used at the highest levels including the Volvo team Abu Dhabi, Wild Oats XI, and the Clipper Race, the round-the world event for amateur sailors. 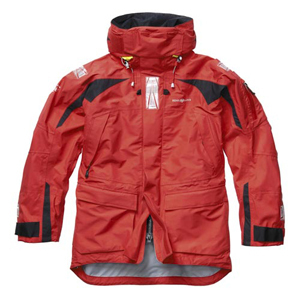 Gortex Ocean Explorer Jacket. Hot features: for men and women, protected hood with patented visor, hand-warmer pockets and EPIRB compartment, storm flap on zip, welded seams, Cordura reinforcement and adjustable cuffs. Ocean Explorer HiFit Trousers. Hot features: for men and woman’s cut, hand-warmer pockets, storm flap, Cordura reinforcement, and unlined for quick drying and free movement. Sydney-based Burke has been supplying competitively-priced sailing clothes for about 35 years and manufacturers a range of offshore and inshore gear. Its offshore Southerly Jacket uses the company’s own PB20 triple-layer breathable fabric, while its inshore range is made from CB10 fabric, which is also breathable. CEO Martin Burke developed the Southerly range in conjunction with leading Australian yachties and his clothing has featured in many Sydney Hobart races, including being worn by the author of this article, who vouches for its durability. Burke Southerly Jacket. Hot features: welded seams, draining pockets and secure internal compartment, seat reinforcement, harness loops, weatherproof two-way zip, wrist seals and adjusters, fleece-lined pockets, high-visibility tape, EPIRB and knife pocket with lanyard. Burke Southerly Trousers. Hot features: internal gusset, articulated knee construction, fast-draining leg pocket, 500D Cordura knee and seat reinforcement, hand-warmer pockets, wide and easy adjustable braces, and external ankle adjusters. internal gusset, articulated knee construction, fast-draining leg pocket, 500D Cordura knee and seat reinforcement, hand-warmer pockets, wide and easy adjustable braces, and external ankle adjusters. 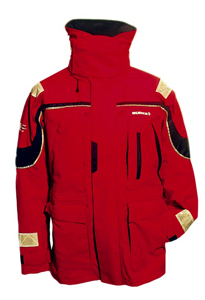 Norwegian Helly Hansen pioneered foul-weather clothing for fishermen before the company went on to create North Sea survival suits and sailing garments. Founded in 1877, the company has plenty of R&D expertise to bring to sailing. It has a wide range of wet-weather gear that includes the lighter-weight Skagen line. Its premium Ocean gear is made of proprietary Helly Tech three-layer breathable fabric, with many high-quality features such as waterproof zips and a styling that stands out. Volvo Team Sanya are currently using this range in their round-the-world campaign, so again there will be plenty of R&D for improvement for this ocean-toughened apparel. 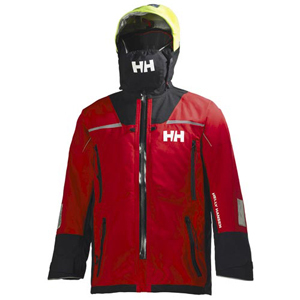 Helly Hansen Ocean Jacket. Hot features: stretch Helly Tech fabric, YKK Aquaseal waterproof zips, Polartec fleece collar, adjustable hood, cuffs and waist, Solas approved reflectives, and articulated arms and elbows. Helly Hansen Skagen Offshore jacket. Hot features: men and women fits, two-layer construction, suites coastal sailing, fleece-lined collar, double storm flap, Scandinavian styling, and Helly Tech breathable fabric. 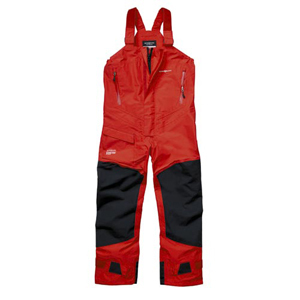 Helly Hansen Ocean Trouser. Hot features: bibs seat and knee reinforcements, high back, two-way front zip, and adjustable leg flaps. Stormy from Tasmania has been making offshore safety equipment since 1993 for both commercial and recreational boating. Its range includes life rings, vests and jackets. Last year it attained ISO accreditation for its inflatable clothing, the Stormy Jacket and Stormy Vest. It is also meets Australian standards. 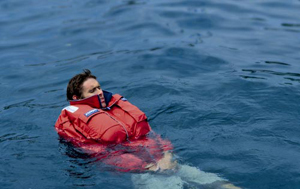 The internal PFD design is based on the sensible rationale that its products are effective because they are worn and not stowed, like normal lifejackets, therefore they save lives. Construction is a nylon outer shell and polyester internal lining to provide both warmth and water protection for all weather conditions. All products have an impressive five-year warranty. a storm flap over zip. Stormy's integrated jacket and PFD gives the wearer an extra level of safety. SLAM is a brand synonymous with top-level racing and highly technical clothing. Materials used are proprietary three-ply breathable nylon, with Italian styling that invariably identifies the product as SLAM. Recently, the Italian designed range has widened its appeal, as Australia CEO Marcus Ashley-Jones told Trade-a-Boat. "With our newest Force range, we are broadening our market to cater to a wide range of sailors and offering mid-range prices as well," he tells us. 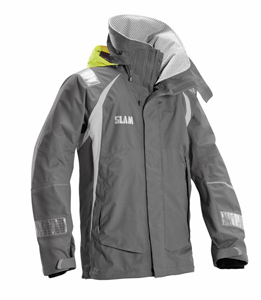 SLAM will be releasing the new Force collection, a range of technical wet-weather gear suitable for the budget-conscious daysailor to the extreme offshore racer, at the Sydney International Boat Show. The four-level line uses two-layer nylon composites on its Force 1, 2, and 3 products, while triple layers are employed in the top-level 4. As mentioned earlier, Force 4 is currently being tested by the Volvo Groupama team and will be available here this coming summer. SLAM Force 4 Trousers: Hot features: adjustable waist, reinforced nylon canvas seat and knee, and several pockets for tools. SLAM Force 4 Jacket. Hot features: race proven, three-layer rip-stop breathable nylon, rubber cuff seals, inbuilt drainage, thermo taped seals, double collar with double closures, and available with body armour. SLAM Force 3 Jacket. 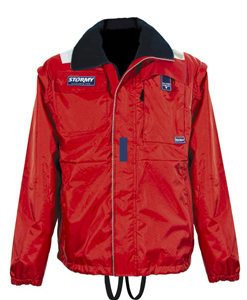 Hot features: inshore/offshore, two-layer rip-stop nylon breathable, storm collar, micro-fleece lined pockets, reflective strips, pocket emergency whistle, large reflective hood, and safety tabs on the zipper to attach a beacon or knife. use than inshore, while coastal garments tend to offer the least protection but is lighter weight — and useful in the tropics. The differences are in the weight of fabric, features and the overall standard of the garment. However, wearing heavy offshore gear for boating around Sydney Harbour is not only overkill, but will also reduce your enjoyment on the water. The varied Australian climate dictates that more than one set of gear might be needed for year-round boating. Note: Importantly, but beyond the scope of this editorial, are the extremities: as head, hands and feet are essential to protect. › Base materials used: weight, breathability, stretchable. › Stitching quality and overall cut: welded seams. › Durability: abrasion protection, reinforced gussets. › Fitment: men/women cut, suitable size (to include clothes layers). › Drop seats in trousers: for quick toilet breaks.